The Golden Gate Bridge was first constructed on January 5th, 1933 and finished on May 27th, 1937. When it was completed, it was the longest suspension bridge in the world, spanning approximately 9,000 feet over a 400-foot deep strait that marked the entrance of the San Francisco Bay from the northern tip of the San Francisco peninsula to the southern point of Marin County. The idea to construct the Golden Gate Bridge started shortly after gold was discovered near the Sierra Nevada Mountains to the East of San Francisco Bay in 1848. 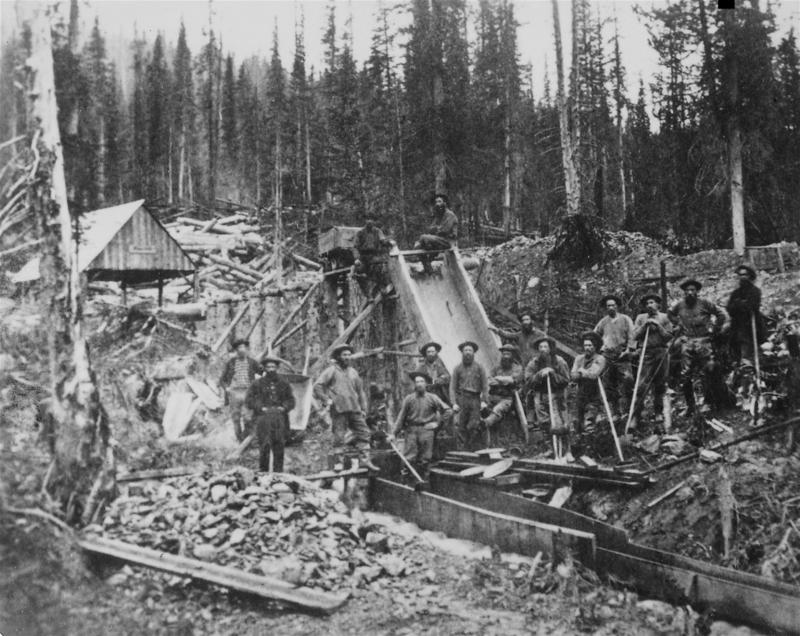 This discovery created the Gold Rush boom in 1849, which brought hundreds of thousands of people to the San Francisco Bay Area in pursuit of striking gold for themselves. As more and more individuals started to migrate to the San Francisco Bay Area, it was quickly realized that the presence of a bridge connecting the San Francisco peninsula to Marin County was needed since only a ferry service existed previously. Moreover, such a project would make the land in Marin significantly more valuable by having a direct connection to the city of San Francisco. In 1916, San Francisco city engineer, Michael M. O’Shaughnessy, sought proposals for a suspension bridge. He had estimated that the cost to build a suspension bridge from San Francisco to Marin County would cost $100 million, which would equate to roughly $2.12 billion in 2009 dollars. This amount was too expensive and O’Shaughnessy sought proposals from other engineers that would be more feasible financially. One engineer by the name of Joseph Strauss determined that a suspension bridge could be built for about $25-30 million, and with O’Shaughnessy, they put the original plans together for the Golden Gate Bridge (named by O’Shaughnessy himself). Construction of the Golden Gate Bridge was planned to start in the 1928, but due to the effects of the Great Depression, financing for the Golden Gate Bridge was hard to source. In 1930, the counties in the San Francisco Bay Area agreed that they would issue $30 million in bonds to finance the construction of the Golden Gate Bridge. However, these bonds sold unsuccessfully. It was not until 1932 that locally-based Bank of America agreed to buy the entire bond issue to finance the Golden Gate Bridge project. Besides financial pressures, the construction of the Golden Gate Bridge also faced pressure from the Golden Gate Ferry Company, who filed a lawsuit against the construction of the Golden Gate Bridge because its creation would create competition for its ferry services. Additionally, the U.S. Military had many concerns with the construction of the Golden Gate Bridge with regards to security and the passage of ships in and out of the San Francisco Bay. 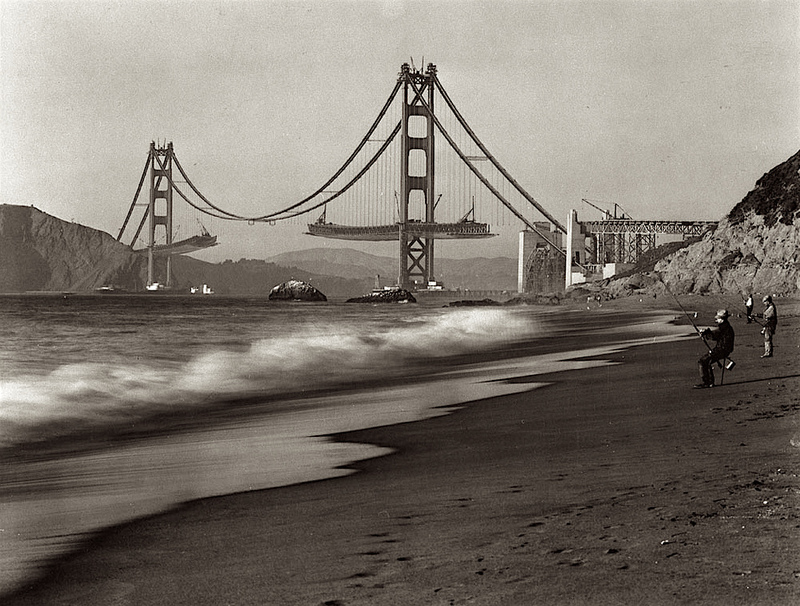 By January 5th, 1933, all the issues had been worked out and the four-year construction of the Golden Gate Bridge began. On May 27th, 1937, the Golden Gate Bridge was completed for a total of $27 million ($1.3 million under-budget and ahead of schedule). A total of 11 workers died during its construction (10 from the same incident when the scaffold holding them fell due to faulty supporting bolts and the safety net was not strong enough to bear all the weight, leaving them to fall 200 feet into the water below). Spanning a total length of 8,981 feet across, and 220 feet over the water, the Golden Gate Bridge was the largest suspension bridge in the world at this time. Its two main cables that pass through its two 746-foot towers are made with 27,572 wires each, measuring out to 80,000 miles of wire. The color of the Golden Gate Bridge is an orange-vermillion color called “international orange” to help with its visibility in the fog. 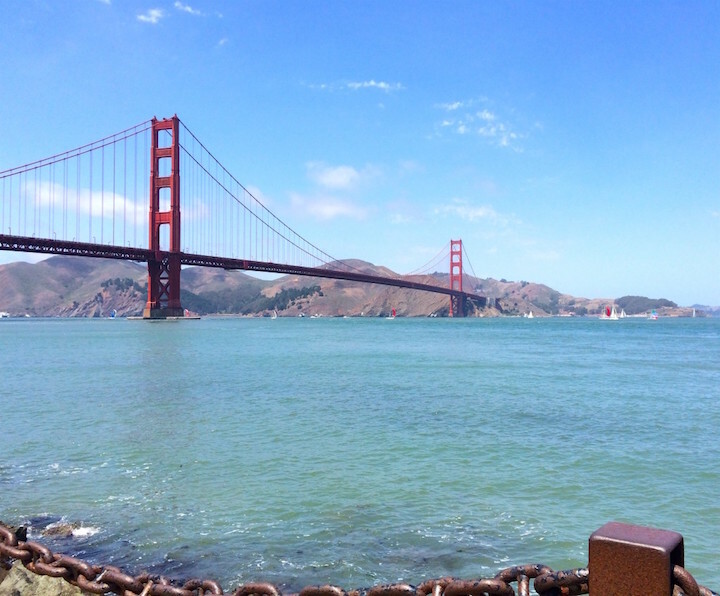 Since its completion, the Golden Gate Bridge has been an iconic landmark for San Francisco. The Golden Gate Bridge remains one of the most photographed bridges in the world and allows for cars (approximately 110,000), people, and bicycles to cross this bridge each day. 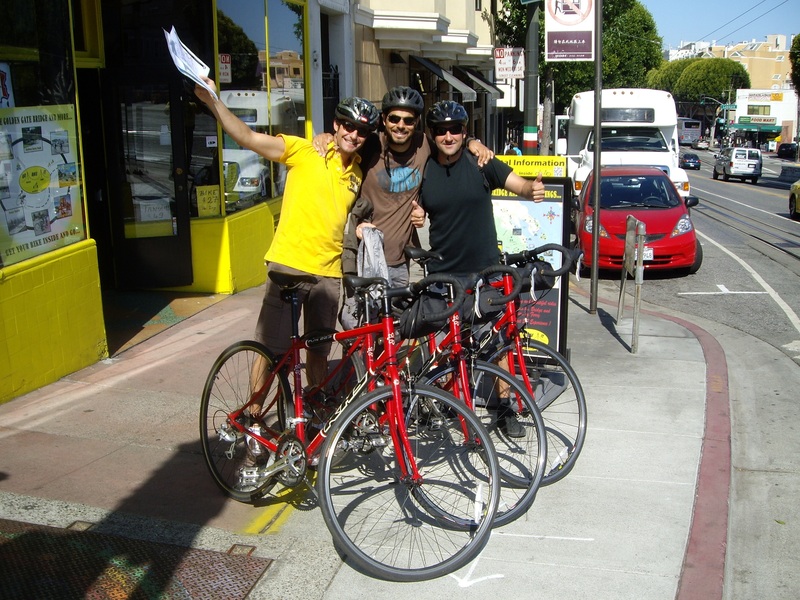 Bicycle tours of the Golden Gate Bridge are available through our website and are also apart of our Alcatraz – Golden Gate Bridge Tour package. 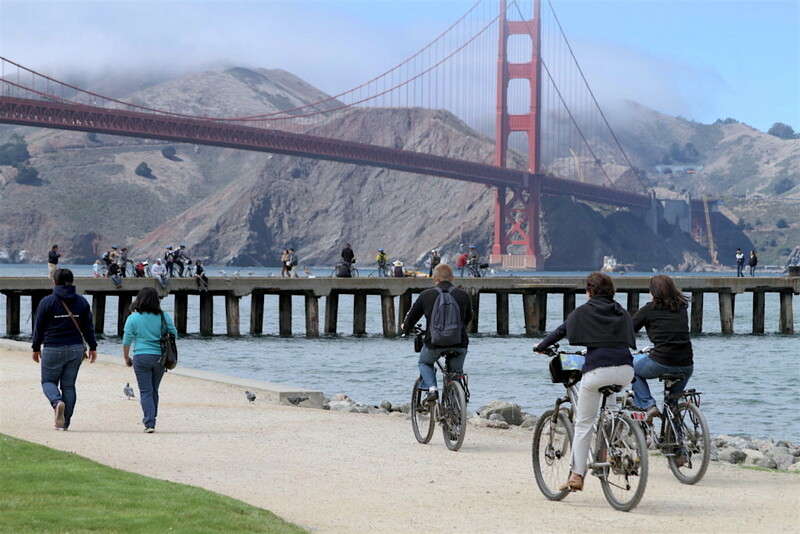 Columbus Cyclery is conveniently located in North Beach San Francisco, just a few blocks away from Fisherman’s Wharf and ten minutes from the bicycle path that takes you across the Golden Gate Bridge. We have bicycles of all sizes and all types including comfort hybrid bikes, road bikes, mountain bikes, electric bikes and tandems. For the smaller ones, we have kids bikes, tag-alongs and even trailers. The ride from the bicycle shop to the bridge is a family-friendly ride, consisting of a five-mile ride almost entirely of a leisurely bicycle path. 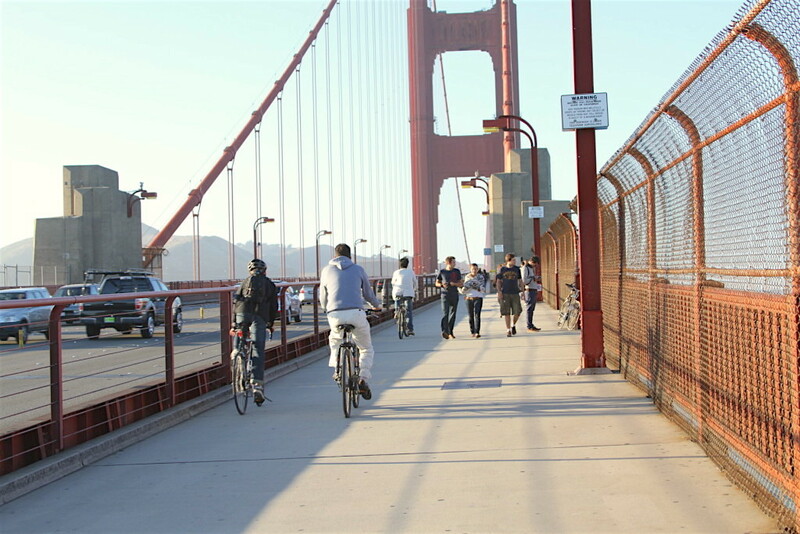 While the ride across the bridge to Sausalito is easily done on your own with only 8 miles to go, we do have a guided bike tour in July and August leaving our store at 10:00 am daily (please arrive 15 to 20 minutes before 10) and lasting about two and a half hours. Once in Sausalito, you are on your own. The options are numerous such as: continuing further to Tiburon (another 8 miles) and coming back to San Francisco on a commuter ferry boat, visiting the Sausalito houseboat community, exploring the marin headlands, or heading back to San Francisco riding your bike or via ferry boat. You have the bike until 8:00pm. Guided Tour is $70. Again, guided tour is July-August exclusively. For the period September to June, the Bike Tour is Self-Guided exclusively.